Holidays are over, so with new energy we continue our implementation of the smart solutions of RUGGEDISED. 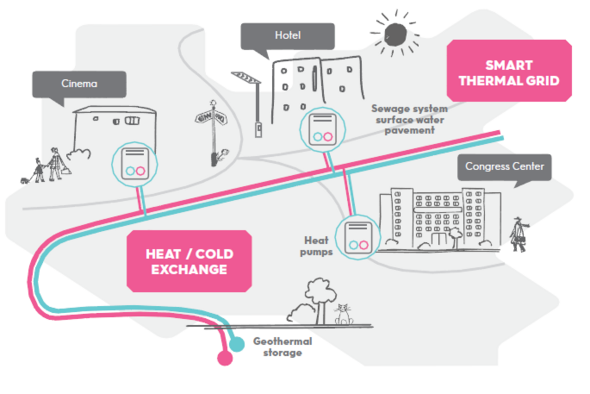 In the last half year in Rotterdam there were some serious negotiations with the future building owners about the benefits for them to join the smart thermal grid. Finally, AHOY and the future cinema owner recognized the sustainability benefits of the smart thermal network. They also want to transform the ‘Heart of South’ in one of the most sustainable areas of Rotterdam. All people working on the Heart of South Area believe that something beautiful will come out of the cooperation of the Area Development Team and RUGGEDISED. They needed some time to get to know each other, but now there is trust in mutual objectives, and the work is getting along as they know this is for the benefit of all the Rotterdam people living in the Heart of South. At the moment the building of the Arts Center and International Congress Centre is well under way. The basement of the Arts Center is almost complete and the building is almost on street level. The design is being fine-tuned to make the roof ready for solar panels. As part of the installations the Eneco/Simaxx software for energy management will be installed in the building (and in the swimming pool) in order to get a building with a very low energy consumption. In September, the backbone of the thermal grid, the main pipes, were laid between the cooling machines of the Ahoy building and the new convention centre. The work went on very well and AHOY is very enthusiastic about having one of the most sustainable buildings, with low energy consumption and low CO2 emissions, on the south bank of the river Maas. In addition to the construction activities, the design team is working on a plan for public space in the centre of Heart of South. 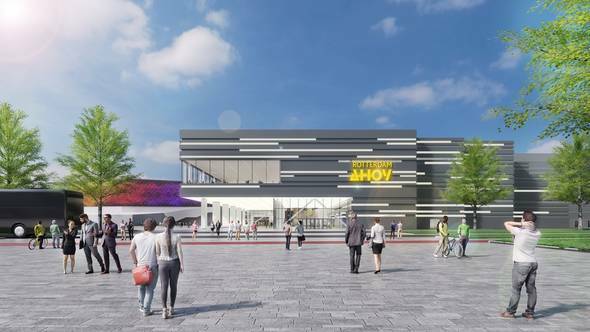 As ‘a concrete area’ built in the 70’s of the last century, the public space will be transformed into a green urban space, with plenty of room to relax, to shop, to eat & drink and to go to theatre or cinema. It will be a hot-spot on the south bank of the river.